i recently bought a services watch and i am trying to find any information about the company etc. googling(?) draws a blank. Is the manufacturer 'Services'? If so there is a thread in the pocket watch bit titled 'services pocket watch', that has much info. If it is not made by 'Services', who is the manufacturer? Ok, The Services Watch Co., Ltd was founded in Leicester by a Frank Liquorish sometime in 1926/27, it was dissolved on 26/11/2002 although I gather from Steve Burrage who used to work for the company that Services watches stopped being produced in the late 1970s.The company never actually made watches themselves instead they either had them made by other firms or bought parts in which were then assembled in the Services factory. The earliest Services watch I`ve so far come across was made in 1927 using a 15 jewel movement made by the Fleurier Watch co., Switzerland it was fitted in an Edinburgh hallmarked silver case. However during the early years & up to WWII one of their main suppliers appears to have been Thiel Brothers of Thuringia who made complete watches (pocket & wrist) for them. At first these appear to have been marked on the dial as `German Made` changing over to `Foreign` or `Foreign Made` probably by the end of the decade. So far the German Services watches of this period I have come across seem to have simple but sturdy unjeweled pin-pallet movements. In addition to Thiel Brothers sometime in the early/mid 1930s Services appear to have begun sourcing watches from The Oris Watch Company Switzerland this arrangement continued into the 1950s, there may have been other suppliers but I can not confirm that at this time, some were marked as being `Swiss Made`others were like those from Thiel marked `Foreign`. Despite the company name I have so far not come across any indictation that Services watches were actually issued to any members of the armed forces although some `Transport` models were used by the Air Raid Precaution wardens during WWII. 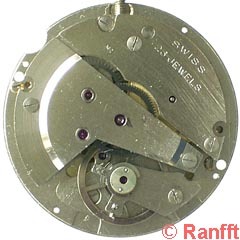 Initially after the end of WWII the company continued to source from Switzerland (the Oris Watch Company), these for some reason these continued to be marked as `Foreign`. Possibly due to restrictions on importing `luxury` goods during the early 1950s Services switched to UK based suppliers such as Louis Newmark Ltd., Perfect Works,Stafford Road, Croydon, Surrey (marked Made in England`) & later by the Anglo-Celtic Watch Co.Ltd., Gurnos Works, Ystradgynlais, Wales when they are usually marked as being `Made In Gt Britain` (or similar).While most Services watches from this period used un-jewelled movements there were a few 5 Jeweled models. From around the early/mid 1950s Services begain again sourcing from abroad, their range including a chronograph using a 17 Jewel Venus movement (there had been at least two other Swiss made chronographs made in the 1930s). From the 1950s until Services ceased production they produced watches sourced or using parts from Switzerland, Britain, France, East & West Germany, Russia & Hong Kong. NB this information is based on observation & talking to an ex-Services employee. This post has been edited & updated as it has appeared in it`s original form elsewhere on the internet & I therefore thought it best if new information was added & obvious errors were corrected. Used up until the late 1950s, as above they usually (but not always) had the model name on the dial. below an S inside a shield, without model name. Used until the company ceased production. mine has services in a curve with large "s" each end beneath which it says 17 jewels.the other dial marks sre "shockproof" and "swiss made" at the bottom of the dial.the watch has a date. thanks mach,that sums it up nicely. Oo! I know that one. My watchmaker had one for sale recently. Mac, for your records in case I haven't mentioned it before, Services pocket watches in the inter-war period were sourced from Thiel Brothers, Ruhla (later known as UMF Ruhla). Thiel Bros also marketed their watches in Britain with the 'Champion' brand. An interesting connection as in the 1960s both Services and Champion brands appeared on Ruhla Electric watches. 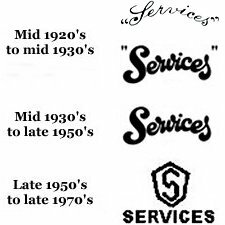 Thanks, I have wondered if there was a connection between Services pre & post war German suppliers. You mention that Services scourced their pocket watches from Thiel Bros, would it not be likely that the pre-war German wrist watches also came from them or were they only manufacturing pocket watches at that time? I too am a very pleased owner of a Services wrist watch! I bought it some years ago and it's still one of my favourite pieces. Silver face and case, black hands and a red second hand which sweeps through the dial very pleasantly. 15 jewels, model name "Diplomat" and marked Swiss Made inside and out, with a numbered case back. Judging by the numerals and general style, I'd guess it dates to the late 30s. A very pleasant watch and apparently quite a rare item, especially the model. Services Diplomat `Swiss Made`, A.Schild cal.1187 15 jewels, circa mid 1950s. I am new to this forum and have tried to post a picture of a services brooch watch I recently inherited with no avail! I have never seen a watch like this so any information would be much appreciated. It is set into a rhinestone brooch with the brooch itself looking like a posy of flowers tied into a knot. The watch hangs from this posy, being a small round case surrounded by the same rhinestone as the brooch. It has services on the dial and at the bottom made in Great Britain. I have opened the watch case and there is nothing printed inside. It is really quite beautiful and sparkles in the light. Does anyone recognise this description? Hi Cathie, without a photo it`s difficult to comment about your watch except to say that having "Made In Great Britain" on the dial indicates that it was made for services by the Anglo-Welsh Watch Company Ltd.,see The "Tick-Tock"
Thank you for that I see that it is mid 30's to 50's it also has 7 jewels on the dial, I have a feeling it was made to order if that was possible, as it is so unique looking. As it mentioned in the link; The Anglo-Celtic Watch Company was set up in the 1940s but as far as I can gather they did not start making watches for Services until the mid-1950s which, I suspect is when your watch was produced. I have come across no indication that Services ever `made to order` they do however appear to have sold ladies, broach & pendant watches in a number of different designs over the years. Thank you this is one of them, I will try to get a picture put on just to let you see it. Thanks to you I now know a good bit more. You`re welcome, I have a special interest in Services watches & my watch repairer used to work for the company. 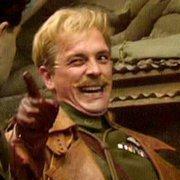 Is it one of these perchance? Lola unjeweled pin-pallet movement, circa mid 1930s. I have a Services Diver. Black face and black second hand. S in a shield work Services underneath. A look inside reveals a EB 8800 17 jewel movement and movement and case marked Sindaco ltd. I'm guessing 60's as no quickset date. Sounds about right though a photo might confirm it also does it mention if it`s "Waterproof" or "Water Resistant"?